Proudly serving Maple Ridge, Pitt Meadows, Mission, Langley, Port Coquitlam, Coquitlam and north Surrey. Pacific Eye Doctors is proud to carry The Bruder mask. The Bruder mask is a moist heat eye compress that naturally treats conditions related to chronic dry and blepharitis by opening the glands in the eye and allowing the natural oils to flow back into the eye. The Bruder mask is safe, self-hydrating, anti- bacterial and non-allergenic. 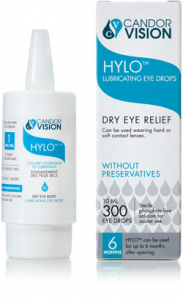 HYLO FRESH are lubricating eye drops that have a calming effect on burning, scratchy and irritated eyes. Thanks to their special ingredients; Euphrasia and hyaluronan, the drops help to create the natural tear film and thus alleviate symptoms such as redness or itching that are common with Dry Eye.